This is the third in the Quadtych series being done on Egypt. This is the continuation of the series I started recently to provide CC with the Ancient Egyptian series, and will tie in with the Valley of the Kings. 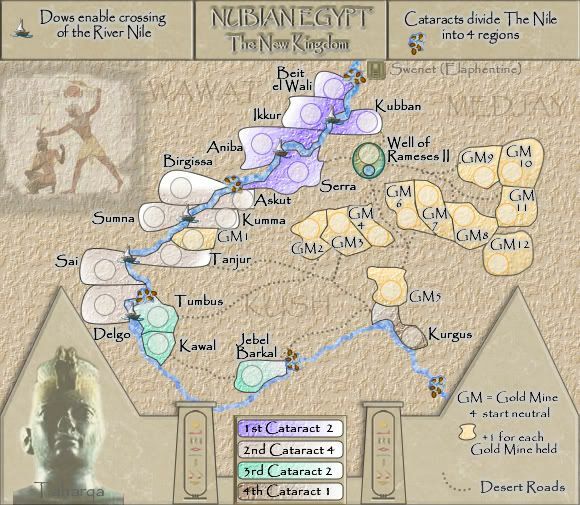 The cataracts on the Nile divide the region up. These territories are NOT in line with the previous Lower and Upper Egypt maps in that those maps are based on the traditional 42 NOMES of Ancient Egypt. 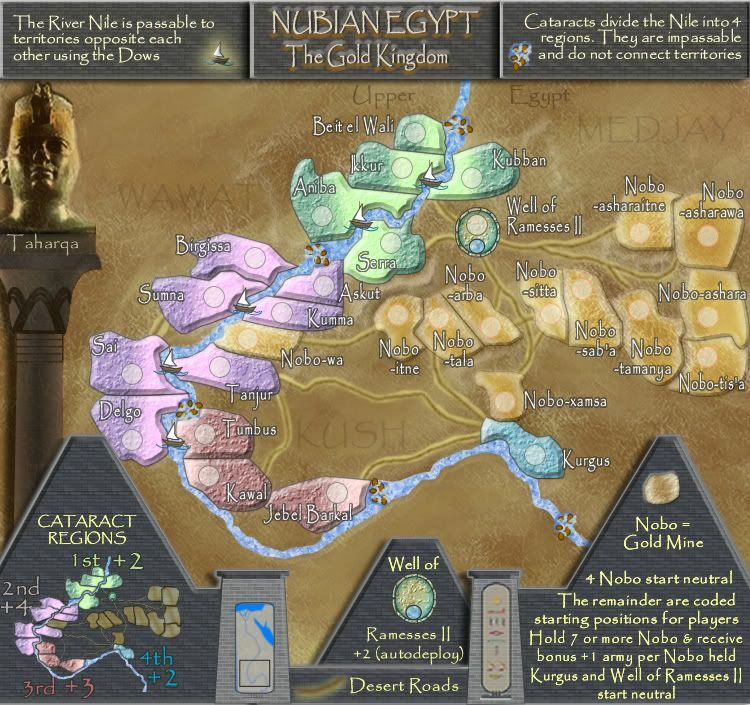 This map is based on the fortresses that lined the Nile Valley in this upper Egypt and Sudan regions, and where the Egyptians are beleived to have obtained a vast amount of their gold from. Bonuses are on the map. This is a design based on the pyramids and chapels (in front of the Black Pharoah's pyramids) from this regions, which is known to have more pyramids than Egypt Proper had. The design features one the Black Pharaohs - Taharqa from this region. The region is very sparse of settlements and thus the emptiness of the map. I may fill this up later with some design elements. 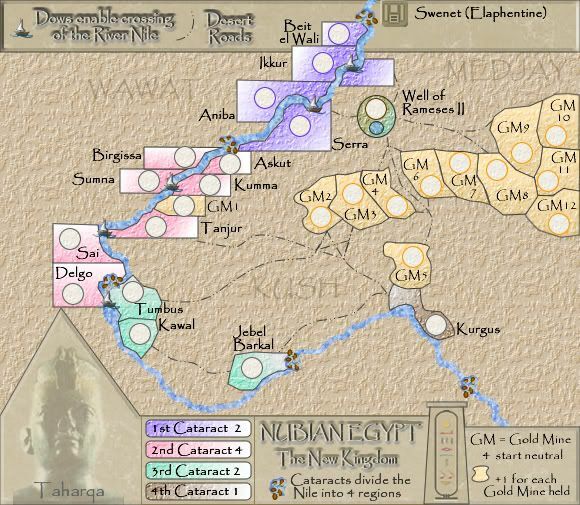 This continues the classic style of gameplay from the Lower and Upper Egypt maps with slight variation. The Dows still enable crossing of the Nile. Last edited by cairnswk on Fri Jul 08, 2011 5:57 pm, edited 35 times in total. Unit_2 wrote: The link is broken. Ok, now I can see it. -The connection lines are too hard to see. Unit_2 wrote: Ok, now I can see it. When are you going to update the Development Atlas...you haven't been in there since Mar 15? I have posted that I will do it if you aren't interested in keeping it up to date. The very rigid and rectangular Nile-bordering territories look unnatural in the desert. Could you round off the edges and make it look more smooth? Also, as Unit_2 said, the colors are too bright and the attack lines could be darker. ZeakCytho wrote: The very rigid and rectangular Nile-bordering territories look unnatural in the desert. Could you round off the edges and make it look more smooth? This i will have to consider after discussion with oaktown and Ruben Cassar, i am trying to accommodate the colour challanged with these maps....so hold tight on that issue, please everyone! Black Pharaohs? Hmm are you sure? As far as I know the ancient Egyptians were not black but mostly white Mediterranean stock. The Nubians were the slaves of the Egyptians who were black. These people were forced to work for the Egyptians and help them build their pyramids. Check about this though, cause Ancient Egypt is not my area of expertise and I might be wrong. Ruben, for your edification, The National Geographic article about the Black Pharaohs. Nubia WAS a source of slave labor and cheap trade in the early and middle kingdoms, but as warlords tore the region apart, the Nubians (Taharqa being the first) came in and founded the New Kingdom, rebuilding Egypt's legacy as it once was. Cairns, I agree with what people have already said about the colors and too-straight territories. I am also confused by the Gold Mines. They seem to be biasing play to the right side of the map, and it's possible to hold a +5 bonus while defending only two territories (GM8-12). Granted the earlier gold mines are better-connected and harder to hold, but the ones to the far right are imbalanced as it stands. TaCktiX wrote: Ruben, for your edification, The National Geographic article about the Black Pharaohs. Nubia WAS a source of slave labor and cheap trade in the early and middle kingdoms, but as warlords tore the region apart, the Nubians (Taharqa being the first) came in and founded the New Kingdom, rebuilding Egypt's legacy as it once was. I am sure it will be a very interesting read. Yes Ruben, just google for anything on Nubia and Kush and the Black Pharaoh's...I too was very surprised...and yes i read the article from National Geogrphic and saw the TV program on it just recently, that is really what prompted me to complete this quadtych. Adjustments to the mpa coming up in V2. Ruben, how are the colours? 1. changed the colour on one of the terts. 4. titles & texts in line with Upper Egypt map. - Taharqa's name got washed out. - Gold Mines seem cramped despite the abbreviation. Maybe resize the territories, since that seems to be a very negotiable part of the map. The legend area describing the gold mines is very vague. "4 start neutral." Does that mean GM4 starts neutral, or four of the GMs start neutral, or each GM starts with four neutrals, or something entirely different? I think, depending on your meaning, this part could be clarified. wont these games before over almost before they start? 8 gold mines that give +1 as starting territories. one guy in a three player game having 5 or 6 of them will happen. maybe make the mines a majority held bonus or something? Does it have to have a purpose other than being a tert in a gameplay? HuH??? They're not cramped and i don't think need re-sizing. I'm happy with them but may change them later. I'm referring to the GM text. GM4 is almost unnoticeable. As for region names, I'd like them a little more noticeable than that. Bonuses are solidly defined, so making the region names more visible won't kill gameplay and will add to the rich Egypt flavor you've suffused the other maps with. ZeakCytho wrote: The legend area describing the gold mines is very vague. "4 start neutral." Does that mean GM4 starts neutral, or four of the GMs start neutral, or each GM starts with four neutrals, or something entirely different? I think, depending on your meaning, this part could be clarified. edbeard wrote: wont these games before over almost before they start? is that possible in the xml?